Check out our other Men’s and Boy’s Matching Product Listings. Bows, Cravats, Pocket Squares, and Cufflinks in 12 Colours! New Swirl Jacquard Men’s Waistcoat. 6 buttons with adjustable strap. Check our matching boy’s ties, bow ties, cravats, cummerbunds and waistcoats. 1-2 day delivery. Quality guaranteed. 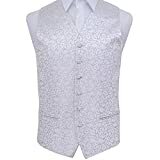 Posts related to DQT New Swirl Jacquard Silver Men's Waistcoat - 40"
This entry was posted in Wedding Store and tagged Jacquard, Men's, Silver, Swirl, Waistcoat by Formal Affair. Bookmark the permalink.